Updated serial communication plug-in is prepared for notarization by Apple. Alphen aan den Rijn, the Netherlands, January 16, 2019–Troi today announced the immediate availability of Troi Serial Plug-in 5.6 for FileMaker Pro 17. What is Troi Serial Plug-in? What is new in version 5.6? 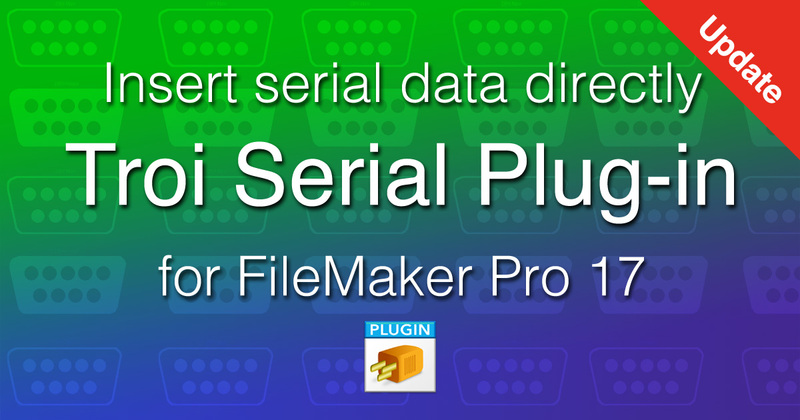 IMPORTANT (macOS only) The minimum supported FileMaker version is now FileMaker Pro 14. Also the minimum supported Mac OS version is now OS X 10.9 (Mavericks). You can keep using version 5.5 for older versions of FileMaker Pro or Mac OS X. (macOS) Prepared the plug-in for notarization: the plug-in can now be added to a runtime, to create a hardened FileMaker runtime app which can be notarized by Apple. Notarization gives users more confidence as the runtime has been checked by Apple for malicious components. More detailed information on all changes and improvements implemented in Troi Serial Plug-in 5.6 can be found on the Serial Plug-in page. A fully functional demo version of Troi Serial Plug-in 5.6 is available on the Serial Plug-in page. A cross platform developer license costs US$ 999. Details can be found on the Serial Plug-in page. You can order licenses from our shop. Version 5.6 uses the 5.5 registration code. The upgrade is free for users who bought a license for Troi Serial Plug-in on or after May 25, 2017. Eligible users have been sent a new 5.5 registration in August 2018. Contact us if you have not received yours. Upgrades from a cross platform developer license bought before May 25, 2017 are available from US$ 399. You can order upgrades from our shop.